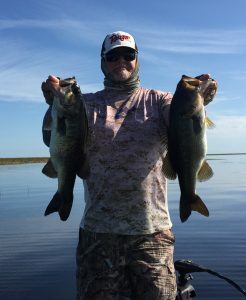 www.okeechobeejust4bass.com (910) 330 9821 – The past couple of weeks we have had a lot of wind up to 20 mph. but the good new is the water level has dropped some and with the last moon the big fish are rolling in. The water temp is in the 70,s and the water clarity is good thru out the lake. Top water and spinnerbaits has been the best in the morning. then I have been casting a Senko in the grass line. Good areas to fish now are J&S , Kings Bar , The Pass and Indian Prairie area of the lake. You also can check the water level of Lake Okeechobee at www.okeechobeejust4bass.com. here is a picture of a couple of fish I have caught this week.